Southold and Shelter Island Suffold Co. L.I. 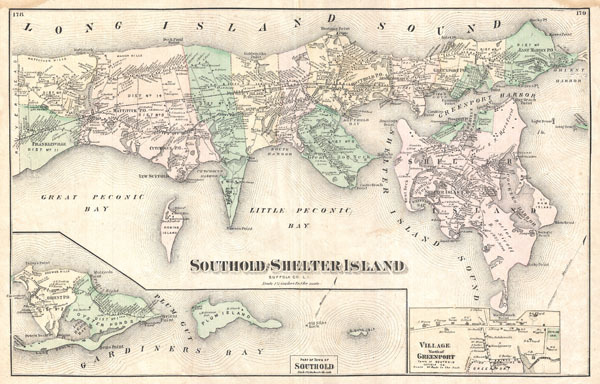 A rare example of Fredrick W. Beers' Map of Southold and Shelter Island, Long Island, New York. Published in 1873, this magnificent map covers from Franklinville and Mattituck Hills eastward past Cutchogue harbor, Peconic Village, Great Hog Neck Southold, Greenport, Orient Point and Oyster ponds to Plum Island. Includes all of Shelter Island in superb detail. An inset map in the lower left depicts Gardiners Bay, Plum Island and Gull Island. Another inset in the lower right quadrant details the village of North Greenport. Beers maps are highly desirable for their superb detail down to the level of individual buildings and household family names. Shelter Island for example denotes the large properties and households of Doctor B. Nicoll, Professor E. Ne Horsford, J H. Tuthill, Sk. Ck Cartwright, M. D. Loper and many others. Prepared by Beers, Comstock & Cline out of their office at 36 Vesey Street, New York City, for inclusion in the first published atlas of Long Island, the 1873 issue of Atlas of Long Island, New York. Very good condition. Original centerfold, as issued. Minor overall toning and marginal water stains in upper left and right quadrants. Verso features maps of East Marion, New Suffood, Orient, Cutchogue and Peconic Village. New York Public Library, Map Division, 1527349.